wargaming in 28 mm and sometimes smaller: Good vs Evil! 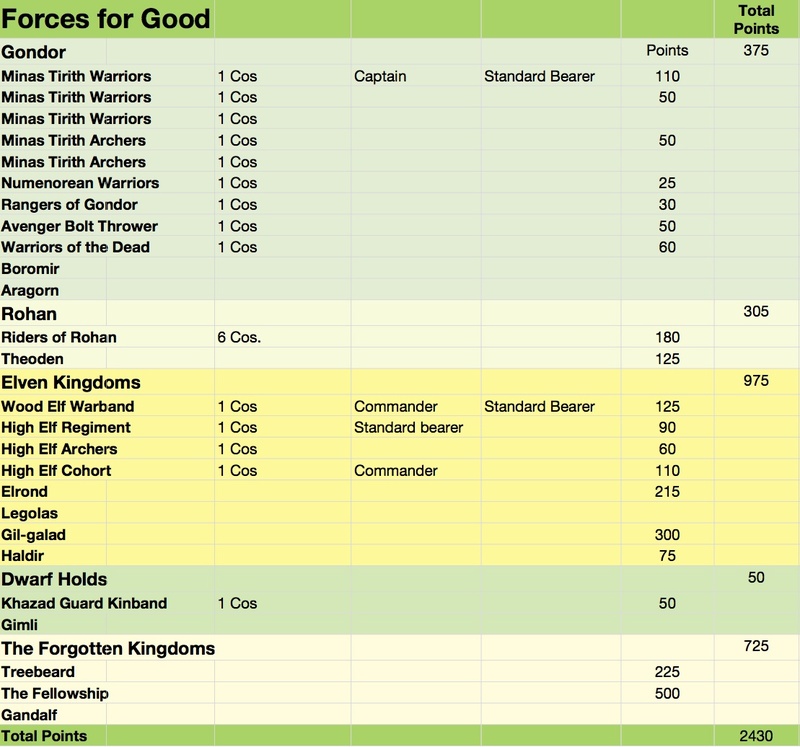 I believe most of my readers have heard me make an occasional negative remark about non-historical wargaming. 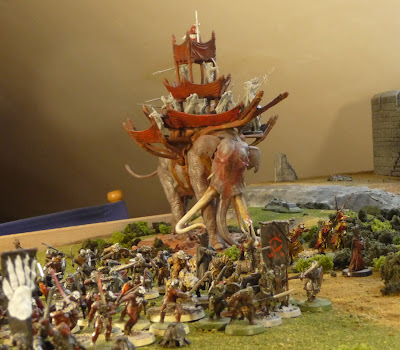 It is not that I have anything against people who enjoy fantasy wargaming and their figures are certainly fascinating, but really to catch my imagination there has to be some attachment to reality. Although, one could argue of course that history is not an absolute reality, but really someone's version of reality. Still though fro me it is nice to think that my wargaming has some basis in the past. What about your attachment to Sharpe, you say, he was not real! Well Sharpe's adventures are set in a very exciting period in history, just like with Uthred or Balista. And I am good with that. Although, I mostly read historical fiction and detective novels now, I did read quite a lot of science fiction when I was younger as well as some fantasy. One story though will always stay with me; I read it in my first year of university almost 40 years, and subsequently read repeatedly all 4 books maybe 4-5 times over the next 10 years. This may have been because my hallucinogen fueled brain was suffering some memory and retention problems, but really I suspect it was because I was completely and still am captivated by the stories. 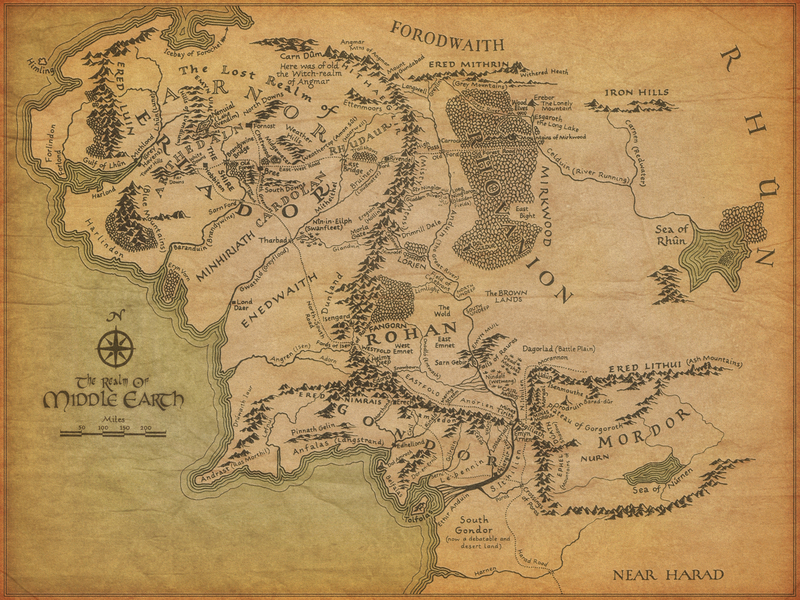 This is of course the story of Middle Earth. I remember with excitement when the movies came out 11 years ago, they were absolutely fantastic and captured well the story for me. Myself and my son Simon who was 9 at the time waited patiently for each installment to come out. It was with great excitement that we would go to the cinema with my daughter and new wife. We were never let down, and there was also the excitement of waiting for the extended version DVD! Jane, my daughter, and Simon used to play a game where the winner was the one who could first shout out "extended" while watching these DVD's. Good times. Also at the time an Evil Empire existed that was clever enough to put gaming shops in malls where there were cinemas and of course one day on our way out we spotted one. This started an intense but relatively short-lived interest of Simon's in miniature wargaming. For the next few Xmas's and birthdays he accumulated many Games Workshop Lord of the Rings miniatures and paraphernalia. Over the next 3-4 years his painting improved and he got quite a few figures done, but by the time the Mumak of Harad had been acquired his interest had reached a trough and the miniatures got packed away in somewhat of a rough fashion and that was it. At the same time though my interest in Napoleonic miniature painting was rising rapidly so it was all good. I can thank his interest in LotR miniatures for getting me started in what is an amazing hobby. Don't worry, I am almost done with the story. 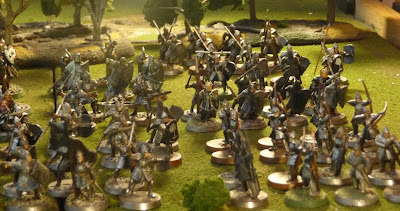 Over the last year, I have been following 2 different blogs with interest: Scott's Wargaming is an eclectic blog with many area of interest, but I always found his LotR posts great. He appears mostly to play the Strategy Battle Game (Skirmish Rules if I have it right) and his figures, terrain and battle reports are first rate. The second blog is L'épopée which has a Rohan based campaign game which is rendered beautifully on the blog. 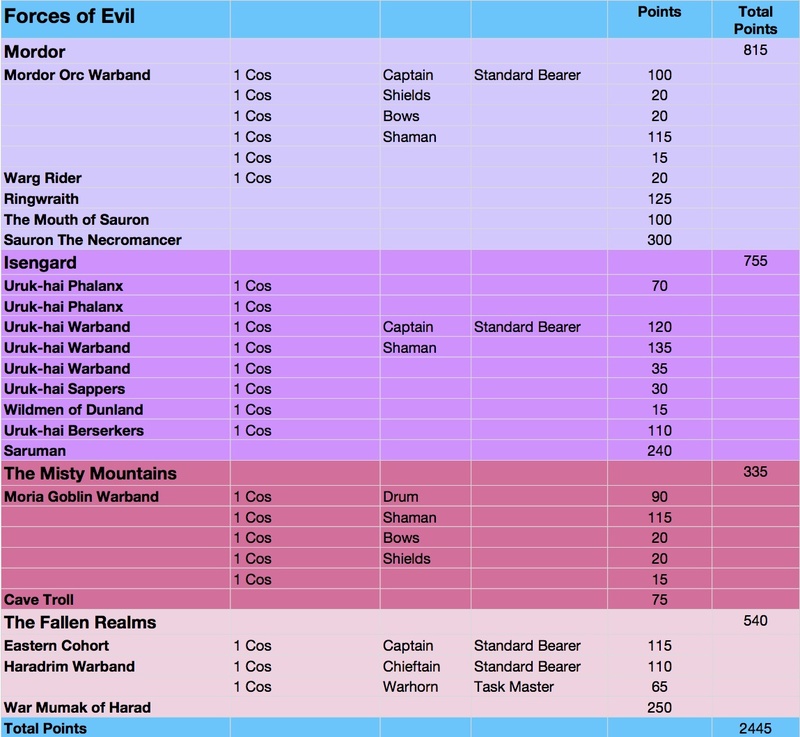 I believe Grognard is using aspects of the War of the Ring (Massed Battles Rules, I am sure I will be corrected if wrong) for this campaign with a cleverly designed campaign game. 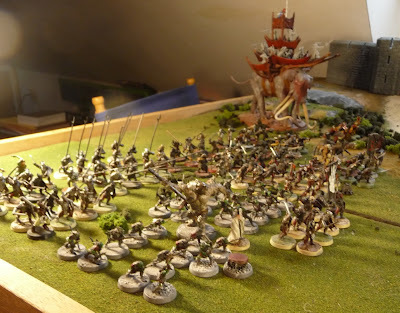 He also has some Napoleonics and generally has a great blog with beautiful terrain and figures. 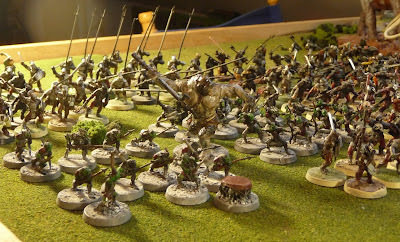 So I have been following LotR miniature gaming for a while, but what finally rekindled my interest enough for me to dig out the LoTR miniatures was Nicolas's Dwarves as seen on his Nowhere to Lead Soldiers Blog. These are beautiful little miniatures with the most fantastic hand painted shields I have seen. I believe he has just finished enough of these GW LotR Dwarves to field a 6 point SAGA Anglo-Dane warband. I just could not resist anymore! So here we have them, Simon's LotR miniatures. As you can see there are quite a few, with about 90% of them painted. The photos are a little dark and no real close-ups. I am really trying to convey the mass of the miniatures rather then their individuality. And yes that is the much sought after Two Towers keep in the background. Evil to the left for the unacquainted! Simon was particularly proud of his White Hand! He did a nice job on the Mamuk, but that is where he stopped. The Elves are some of my favourite figures, they do need a bit of work. I am not sure if you can see, but there was multiple missing and broken bows and spears, all of which I have repaired. So what do we have, well I was shocked. First an apology to those who abhor points based gaming, I do as well, but really it was the easiest way to quantify the troops. 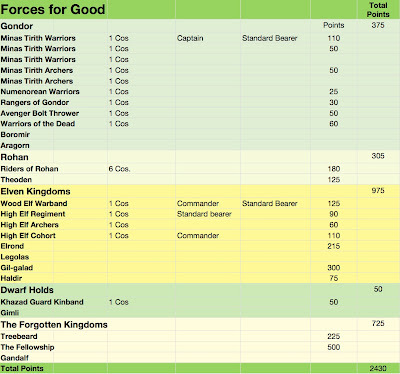 I used the points based system from the War of the Ring Rulebook (the one for massed battles) and started to place the miniatures in companies. As you can see we have a pretty significant force, which was surprisingly equal in strength. So where from here! Well a lot of repairs are needed and there is about 25 unpainted figures. There are also some missing figures that would be required to complete the above Order of Battle, maybe 25 miniatures again. Well I have just received thirty 8 figure movement trays. I really bought these in order to display the miniatures more securely. I believe what I might do is take 8 figures at a time (1 company), touch them up, re-terrain their bases and terrain the movement trays. Whether I ever use them or not is a bit unclear, but they are really beautiful figures and this is what they deserve! A really impressive battle, your pictures are great! I do like the ent! That IS a significant collection! Kudos to Simon for sustaining the interest at that age. 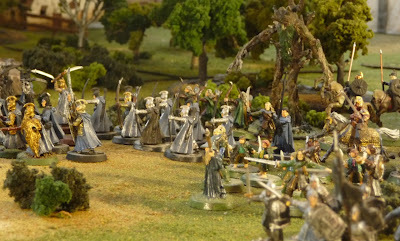 We played the LOTR skirmish game quite alot and really enjoyed it. They are easy to pick up and give a great game. I think you'll have good fun with these. Who knows, if you sell a kidney you could afford to pick up the new Ultimate Hairy Toed Hobbit Edition from GW! That is a big army. Well done on bringing it up to scratch! When the movies first came out, I had the pleasure of introducing my wife to the stories. 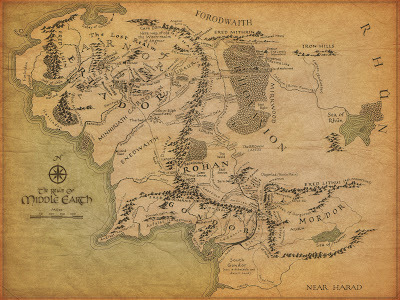 I hope you continue your journey back to MiddleEarth and maybe some LOTR gaming. 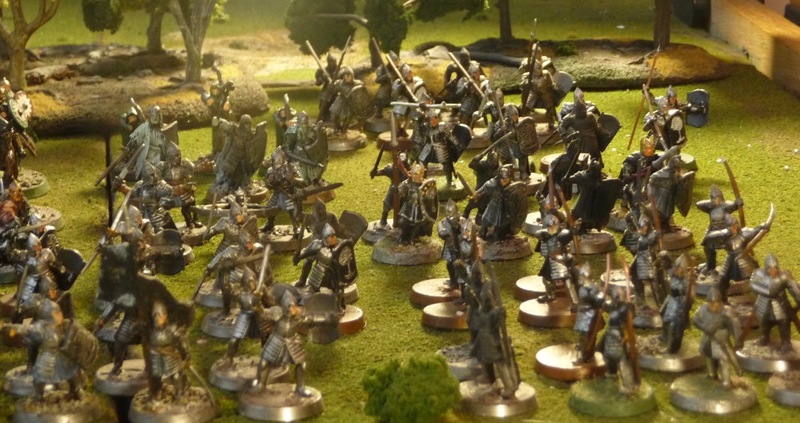 I think there are relatively few wargamers out there who *don't* love LOTR. The story itself aside, this is of course in part because the world that Tolkien created is so detailed, and has a hiostory all its own. Nice to see those lovely LOTR figures. It was a nice figure series and the rules and scenarios were simple but showed great imagination. Since I am a true admirer of your porjects and progress I have awarded you with the "Liebster Blog Award"
And feel free to go on if you like to. Make that a double Leibster nomination, John!